Mount Fuji, locally referred to by Japanese as fuji-san is the highest peak in Japan. At 3,776 meters, it can be seen from many parts of Japan on a clear winter/fall morning. This picture was taken from my balcony in the Akishima area of Tokyo. It looks so near but beleive me, mt. 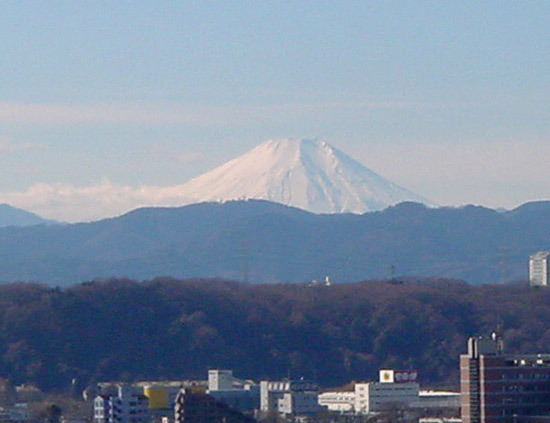 fuji is some three(Tokyo, Kanagawa, Shizouka) prefectures or states away from where this picture was taken. In winter, the snow-capped Mt. Fuji is simply magnificient, a great view and it is adored by all Japanese making it one of the greatest tourist attractions in the whole of Japan. For thousand of years mt. fuji has been a source of inspiration to many artists and poets and it is also an integral part of the people's Shinto religion. Mt Fuji is so famous many Japanese families and companies adopted the name Fuji for their children and companies. Fuji and the hybrid(prefix and suffix) forms are popular among Japanese e.g. Fuji, Fujifilm, Fuji Xerox, Takefuji, Fujimaki, Fujimori etc.